The bowl season hasn’t even started and the coaching carousel is already at full tilt. 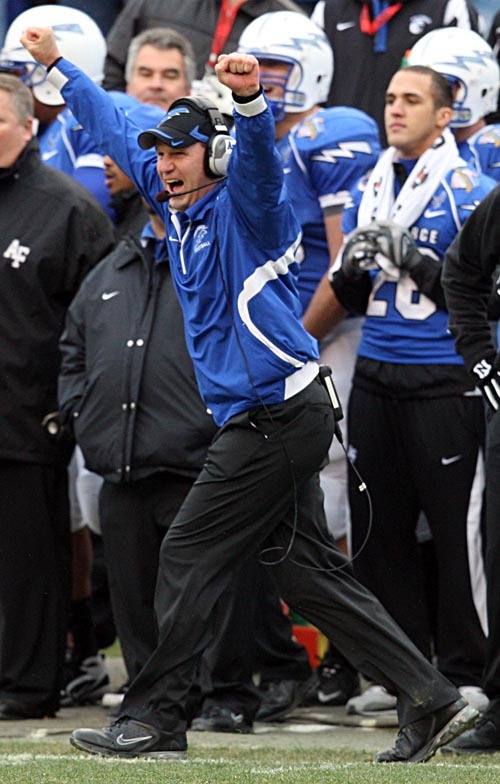 Air Force coach Troy Calhoun has been a target of the BCS schools the last couple years, including the Tennessee scare of last year. This year, quite a few Air Force fans noticed the Colorado job opening and waited to see if officials in Boulder had taken notice of the steady success Calhoun has had in Colorado Springs. The Denver Post is reporting that Colorado officials have reached out to Calhoun only to be promptly denied by the Air Force coach. Good news for Air Force fans, but Calhoun is sure to pop up on other universities’ radar screens as they scramble to find a coach. Air Force lineman Rick Ricketts, who was named to the Mountain West Conference’s second team, told the Denver Post the players expect their coach to get attention from other schools but are glad he wants to stay.